First of all, thank you SO MUCH for clearing up all those misconceptions between those terms. I wish I had just initially gone here instead of spending 3 hours reading up on DNL (Diamond Nexus Labs) in diamond forums. Secondly, I've noticed that most of the companies who produce synthetic diamonds have extensive wait lists for customers wanting their white colored synthetics. I spoke with someone in a forum who just recently received a resonse from Apollo after 3 years of being on the waitlist... I've been on the list for 6 months but frankly I'm not willing to wait for 3 years. I am also on Adia's wait list. Why is it taking so long for them to produce these synthetics? And what is the price difference between a synthetic and a natural diamond? Basically what my husband and I are looking for, is a GUARANTEED non-conflict "diamond", meaning a GOOD FAKE because non-conflict diamonds are virtually impossible to identify so the best way is to steer clear of real diamonds all together. We spent 6 months living in the African DRC so we are very stern on not purchasing a REAL diamond, and frankly some jeweler's "word" is not enough. Can you give us some advice? Unfortunately the reason that Apollo Diamond has so many people on their wait list is that production is just very slow. In most CVD diamond growth the rate of growth is measured in micrometers per hour! It takes a long time to produce one good clear diamond. This is improving. However, the market for gem diamond is measured in the millions of carats. Apollo probably produces less than 10,000 carats a year - maybe a fraction of that. If even a tiny percentage of customers would prefer Apollo Diamond, then they couldn't possibly keep up with the demand, and won't any time soon. Hopefully a combination of better technology and greater investment will change things over the next two decades. By the way, I'd like to thank the poster for this article. I do not work in the gem industry, but I did work in CVD diamond growth for a bit in the past. I find the confusion over the terminology aggravating, and it cheers me up to see it clarified. Like Adeline, having worked in Africa, I'm not in the market for a real gem. I'm looking for a 1ct (equivalent size) simulant pendant necklace for my wife. I would like to know if I should spend a little bit more on a moissanite gem or whether I should focus on one of the CZ alternatives. The advice I have read so far is unclear as all reports appear to be linked to a manufacturer such as Sona diamonds. I have to commend them on their marketing as all references to them appear to be FROM them, all over the web!! Since I am a diamond retailer, I am not an expert in diamond simulants. To answer your question about what stone will make the best pendant for your wife, the real answer depends on what your priorities are. I think Moissanite is a good option for rings because it is harder and less likely to scratch. However, for a pendant the durability is not as much an issue. Cubic Zirconia are available in 6.5 millimeter diameter for less than $5 for AAA quality so you would have to decide if the branded version of CZ is worth the price difference if they are charging hundreds of dollars for the loose stone. For most of the companies that are selling CZ jewelry, the stone is being sold for almost nothing and it is the white gold settings that they are really selling. Often it is less expensive to purchase CZ jewelry from a company than to purchase a mounting and have a loose CZ set in the mounting. When buying a cubic zirconia, I would not spend much time or effort trying to decide on which brand is better. Instead, I would put my focus on the style and quality of the mountings since that will tend to be where the appearance will look good or bad. A well cut cubic zirconia in nicely finished mounting will look better than a poorly cut diamond in a cheap mounting and will be much more affordable. Keep in mind that not all real diamonds come from Africa. We have a lot of clients who request Canadian diamonds, which often come with a laser inscription indicating the Canadian mine that produced the rough diamond. I was wondering if I should buy from DNL (Diamond Nexus Labs). I am looking for a synthetic diamond and not a cubic zirconia. Am I just out of luck? As the article discusses, you do not want to confuse the cubic zirconia (diamond simulants) with synthetic diamonds. The Diamond Nexus Labs stones are cubic zirconia, not synthetic diamonds. If you truly want synthetic diamonds you will need to find a retailer who sells them. If the only reason you want synthetic diamonds is price, you might want to tell us what type of diamond you are seeking. Our prices are so low for natural diamonds that they can be the same or lower than some retailers charge for synthetic diamonds. If the reason you want synthetic diamonds is conflict diamonds, you might want to consider getting a Canadian diamond that is laser inscribed with the Canadian mine where it was discovered. Also keep in mind that a lot of the natural yellow diamonds come from the Argyle Mine in Australia. I also like to remind clients that it is much harder to sell a synthetic diamond in the future than it is a natural diamond since more than 95% of diamond shoppers want a natural diamond. Sona Diamonds is the name of the company but the product they sell is a variety of Cubic Zirconia. They have just applied a coating of some synthetic sapphire material. It is not a diamond. It is not a synthetic diamond. It is just a material (Cubic Zirconia) that looks like diamond. Keep in mind that you can buy round cut cubic zirconia for about less than $25 so you have to determine if these brands cubic zirconia are worth the difference or if you are just paying for a lot of marketing hype. I just paid $340.00 for a pair of .5 CT (1cttw) Moissanite stud earings. Since the stones in earings do not require the hardness of diamonds or Moissanite, would I have done just as well getting cubic zirconia? The store, Kohl's, had real diamonds there, too. The lower quality real ones of the same size went for about $1,000.00 and the highter quality ("certifed" - whatever that means) real ones were about $2,000.00. I know very little about this stuff, but I think the ones I got looked better that the lower quality real ones and about as good or better than the higher quality ones. Now I am wondering if I shouldn't have gone to a jeweler and just bought cz in really good settings. Or waited a few more years to be able to afford real ones. My wife has big ears (still beautiful, though!) so anything smaller than .5 ct might look funny on her. Since every earring shopper has different priorities and requirements, there is no single “correct” answer to your questions. You made an insightful observation that earrings do not require the same durability as a ring so that cubic zirconia is a better option for earrings and pendants than it is for a ring. Since Moissanite and diamonds are very hard, they have the scratch resistance and durability required for many years of wear in a ring. You mentioned the term “certified” which refers to the grading report that a diamond gets from a grading laboratory. For diamonds, we recommend GIA or AGS grading reports because the other laboratories tend to be off in color grading, sometimes 1 to 3 color grades. If diamonds do not have an independent grading report, you can count on the color and clarity grades being exaggerated by the retailer so you really do not know the quality you are buying. You also do not know about the cut parameters, which are key to the beauty of the diamond. For shoppers buying a diamond simulant (Moissanite or some variety of cubic zirconia) who plan on replacing them with real diamonds in the future, we do offer a word of advice. Do not buy too large a stones up front because with the price of diamonds increasing you might never be able to afford that size or bigger in the future. If shoppers purchase real diamonds in the future, they would at least like others to notice they are bigger. There is one common word of advice with buying diamonds, Moissanite, or cubic zirconia and that is to seek out the best cut. Regardless of the material you start with, if the stones are not cut correctly, they will not have the brilliance and sparkle that maximizes their beauty. Also remember to keep the stones clean because dirt, hand cream, grease, and soap scum will dull any time of material and diminish the beauty. Hi, I have been looking for a good quality simulated diamond, (since the synthetic diamonds are priced incredible high also). I came across DiamondNexuslabs and found Signature Series Stones with AIG ingraving and papers. Does anyone know anything about this product? I was just wondering if the cz hearts and arrows are really worth buying. Do you know if they are really cut to different standards than just plain cz's and do they really shine like H&A would or more than any other cz's? With any diamond or diamond simulant (Moissanite or cubic zirconia), it is the cut of the stone that produces the brilliance and sparkle. The Hearts & Arrows pattern in a stone indicates it has great optical symmetry. That means the way light reflects in the diamond is uniform from all directions because the facets were cut with great uniformity. If the cutter took the time to cut the stone with great optical symmetry, most likely all aspects of the cut were above average and you should expect a more beautiful appearance with regard to the cut. While the cost of cutting a Hearts & Arrows CZ is a little more than an average CZ, just do not pay too much for the marketing hype surrounding Hearts & Arrows cubic zirconia. They both start with material that is very inexpensive so it is the marketing and profit margins that adds most of the cost. cz,senthetic and reall diamond.and what is the density of the fake diamond. I was wondering if you have heard any good or bad things about CARAT, which is a simulated diamond according this page. I was looking into buying a ring. Will it wear out or scratch after a few years? Will it stay bright? And how easy is it to tell the difference with your naked eye between this brand and a natural diamond? Thanks for your time. In your opinion, for an engagement ring what is a better investment: a CZ, moissanite, or lab created diamond? The answer depends on how you define “better investment.” If you mean, which stone will go up more in value, then the synthetic diamond is probably the better investment. Of course that assumes you purchased the stone at a reasonable price. If you define “better investment” as being which stone will cost the least, then the CZ is the answer since Cubic Zirconia only cost a few dollars per carat. If you define “better investment” as being the best diamond stimulant, then Moissanite is the answer. Remember a synthetic diamond is a diamond but CZ and Moissanite are diamond stimulants. There is a time, place, and consumer for every type of stone so the answer to which is best for you depends on your shopping priorities and the purpose of your purchase. Today Tonight took the diamond to four jewellery stores to be valued by experts, all members of the National Council of Jewellery Valuers . The lowest valuation was $3,100, then $3,800... $4,150... and a stunning $4,330 , four times its value. Hi, thanks for all the info, but I still can't decide on what to buy!! I am looking for a solitaire 3 carat pendant, and want to know which stone would look the most natural, and sparkle the most. I understand the moissanite gives an artificially high sparkle. It is also more expensive, Would a 3 carat CZ or the Nexus look better? I have purchased studs from Erwin Pearl. Would you recommend them for the pendant also? Thanks. It is very difficult for anyone to determine what you are going to like best. With diamonds or diamond simulants, personal preference dictates what shape, cut, and color is best for an individual. You said you want something that is “natural and sparkles the most” but you seem to be concerned that Moissanite has too much sparkle. Only you will know what amount of sparkle is right for you and this can vary by how the material is cut as well as what the material is for the pendant. Price is part of the decision process and there is a big difference between the price of a three-carat diamond and the $10 price of a cubic zirconia the size of a 3-carat diamond. There are many companies marketing cubic zirconia with brand names and misleading marketing hype. Whether these stones justify the increased price is up to the buyer. Some shoppers seem willing to pay double or triple our prices for diamonds when they purchase at Tiffany’s and the same holds true for shoppers willing to pay more for cubic zirconia with a brand name and a marketing program. Thank you for the excellent information on simulated diamonds. I have made the decision to purchase a simulated diamond vs the real thing. I am now trying to decide how and where to get the most realistic. The exact ring I want is available from Russian Brilliants and Diamond Essence but there is a significant price difference between the two. Can you please clarify the difference in stones between the two. Also, are you able to offer any other suggestions on sites to purchase the most realistic and quality simulants. Thanks! Since Russian Brilliants and Diamond Essence are both cubic zirconia, there really is no significant difference in the material. Given that cubic zirconia is only about $2 to $5 per carat, what you are really paying for is the mounting and the marketing. We are in the real diamond business so are not experts on the various CZ companies and the quality of their rings. Since most of the price is in the mounting, you should be focusing on not only getting the style you want but also the quality of mounting you will be happy with for years. For example, are the 14-karat white gold rings rhodium plated? This should be the last step in making a ring after they have set the stone and done the finger sizing. Rhodium is in the platinum family of metals and is harder and whiter than platinum so helps keep the 14-karat white gold white and makes it more scratch resistant. These companies are making their money selling mountings, not the cubic zirconia so you want to be sure that you are getting your money’s worth for the gold mountings. At a time when gold is close to its highest price, we wonder about the quality of some of the rings we see advertised that are less than our prices for gold rings. Of course, when they are using CZ material that is only worth a dollar or two, they do not have to have the skill doing the setting of the stones that would be required for a real diamond. Assuming the companies have a money back guarantee, I would suggest ordering from the company who has the mounting style you want and then determine if you like what you see. I would not be that concerned about the differences in the CZ. I suspect that there are shoppers who are spending scores of hours researching and deliberating on the purchase of a $5 cubic zirconia. In the end, they might be better off buying a CZ from a jewelry supply company and having a local jewelry repair shop set it in a gold mounting for them. An example of a jewelry supply company that sells CZ is www.fdjtool.com where you can search for cubic zirconia. There are many other suppliers of CZ but this is where I have ordered some to show clients the different sizes of stones. I am considering a white gold asscher or princess cut stone engagement ring from Erwin Pearl that "looks" beautiful. Are their stones typically a good quality in terms of long lasting brilliance and quality. Is there another place you would recommend for a brilliant stone that is not a real diamond, however, looks like one to the naked eye? Most diamond simulants look like diamonds to most folk’s eyes, which is why they are called simulated or fake diamonds. Glass and cubic zirconia are two of the common low priced diamond simulants and Moissanite is one of the more expensive alternatives. Just like every diamond shopper has a unique set of shopping priorities, the same is true for shopper seeking fake diamonds. Some materials can be cut for great brightness, some materials are hard (scratch resistant), some materials have high dispersion (fire), some materials have single refraction of light, and some materials are stable under extreme heat conditions, which are some of the factors contributing to the appearance of diamonds. Since no other material has all these diamond like qualities, a fake diamond shopper must determine which factors are their priorities. What material you think looks like a diamond might not be acceptable to another shopper. Likewise, some diamond simulants are easily scratched or will change color over time or when heated during the setting process, which might not be acceptable to some shoppers. You have to define what you expect by the terms “long last brilliance” and “quality” to assess whether a diamond substitute will suffice for you. Just keep in mind that the most common diamond simulant, cubic zirconia (CZ), only cost a few dollars per carat so it really is the mounting and marketing that are going to be your real cost factors. This site offers the most objective and truthful advice I have found, after--yes--hours of research. This has been the most helpful; thank you! Diamond "hybrids" have not been mentioned here so I thought I would ask: Is this another type of CZ? I am suspicious because the prices are insanely low and the rocks are really huge! The term “diamond hybrid” is usually used to describe the Amorphous Diamond Treatment (ADT) process used in the Asha® diamond simulant. A cut and polished cubic zirconia (CZ) stone is blasted with microscopic diamond crystals to form an extremely thin layer of material that is a combination of the cubic zirconia and the infused diamond crystals. It is difficult to determine from the Asha marketing hype what real benefits are provided by the ADT process that are different than untreated cubic zirconia. They claim the process results in a Mohs hardness rating of 8.5 compared to 8.0 for untreated CZ and other gemstones like topaz, emerald, beryl, and aquamarine. Sapphire and ruby have a hardness rating of 9 so are 50% harder than Asha® material and 100% harder than untreated cubic zirconia. Moissanite, another diamond simulant, has a hardness rating of 9.25 so is several times harder Asha material and is second only to diamond. Care must be taken Asha® material because it can be damaged if a jewelry repair shop thinks it is diamond. The usual polishing materials used to polish diamond rings will often scratch Asha® and cubic zirconia material. Likewise, the gold torch often used for setting, sizing, or repairing diamond rings can blacken the surface of Asha® material and can crack or discolor cubic zirconia. 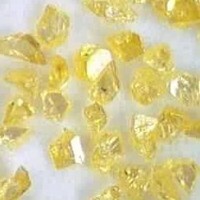 I bought a radiant cut D color loose diamond stimulant from Gordon Max (www.gordonmax.com) about 1 and the 1/2 year ago and have recently bought another vivid yellow 3 carat princess cut stimulant. Since they did not clearly state what is it, I will assumed that they are CZ. But based on my understanding, CZ will eventually cloud and lose their brilliance and shine in matter of months, then why are they able to provide a lifetime warranty for fire, lusture and brilliance? Or are these stimulants being coated or made with any other kind of new materials or techniques? On a related note, I've set the 1st stone into a ring and it indeed retains its shine, brilliance and lusture. Thus, would greatly appreciate your advice, are these CZ? as well as the other questions as above. The people you should really be asking about what you purchased are the folks at Gordon Max. Since the chart on their website compares their material with “Common C.Z.” I would assume the gordonMax™ material is also cubic zirconia. Their chart is interesting in that they make it appear like the gordonMax™ material is more like diamond than CZ, partly because they gave the same ranges for heat resistance and scratch resistance to diamonds as they gave their material. I would point out that diamond has excellent heat resistance and is the hardest material so is very scratch resistant. I would speculate that the gordonMax™ material is really at the Poor/Good range for heat resistance and scratch resistance so is closer to or the same as the CZ. While they claim the gordonMax™ material has been tested to withstand the melting point of 18-karat gold, they do not define what “withstand” means. I would be surprised if the material does not discolor or lose some of its clearness if it is heated to those temperatures or higher. The brief discussion of gordonMax™ does not mention any special coating so it is probably not the Amorphous Diamond Treatment (ADT) process used in the Asha® diamond simulant. I am skeptical if the hardness of the gordonMax™ is really in the 8.5-9 range given that forms of cubic zirconia are generally in the 8.0 to 8.5 range. Note that their chart shows “common C.Z.” as being in the 7.0-7.5 range. Their comparison chart would not be some compelling if they showed accurate ranges because it place gordonMax™ very close to cubic zirconia and quite different from diamond. It is easy for simulated diamond retailers to make claims but they provide little, if any, independent testing to back it up. Concerning your question about CZ quickly losing brightness and luster, the changes happen slowly and are impacted by how you take care of the ring. The more exposure to direct sunlight, chemicals, and abrasives a CZ has, the quicker and more pronounced the changes. As for the lifetime warranty, that does not mean the product will never change. It really means the product cost them so little (i.e., $5 per carat), they doubt any few people will take the time, effort, and expense to return the stone to them for replacement. How do you measure fire, luster, and brilliance? If you cannot measure it, it is hard to prove that it changed. The real issue with cubic zirconia is really more of changing color and clearness, items not mentioned in the lifetime warranty. I would like to know if the "synthetic diamond" as describe by "Arté Madrid" really "synthetic" or are they "fake" diamonds? Please advise. My fiance isn't rich so we're thinking about buying a loose 1 carat stone, either moissanite or cz, in lieu of a diamond to have it set in either a white gold or platinum engagement ring setting. You noted, however that cz may not be able to put up with the heat required to set the stone into a ring mounting. Is there a safe method to set cz? Or would moissanite be a better choice? Does it have higher heat tolerance than cz? Also, I heard that moissanite may have a yellow/green/gray tint in natural light that may give it away. Is it really noticeable? I really don't care that I'm not getting a real diamond, however, coming from a large family that has been well-to-do for many generations, I'd like a fairly convincing substitute in order to avoid ridicule. You said your fiancé is not rich but you do not have to be rich to have a respectable “real” diamond ring. We have clients who purchase a diamond band or a ring with several smaller diamonds instead of a solitaire. For example, four 0.25 carat diamonds cost a lot less than a single 1.0-carat diamond. Some shoppers get a colored gemstone like a sapphire for a center stone and then diamond side stones. Another way to save money is to get a solitaire diamond just under 1.0 carat in weight but still the millimeter size of many diamonds weighing one carat. We sell many diamond rings to shoppers who only have a few thousand dollars and they get beautiful diamond rings. The secret is to purchase from a retailer who has a very low profit margin like my company. Check out www.diamondsourceva.com and we will be happy to assist you. Concerning your questions about cubic zirconia and Moissanite, I believe Moissanite is harder and more heat resistant so is more durable than CZ. The quality of Moissanite can vary so it pays to do some shopping. The only way you can determine if the appearance of Moissanite is acceptable to you is to see it with your eyes. I would speculate that the Moissanite is going to look as good, or better, than most diamonds purchased years ago before shoppers had online education sources and knew about GIA certifications. Beware of Asha Diamond Simulant! Beware of this CZ advertised as the most realistic diamond simulant when in fact it is pretty much like CZ and never going to possess real diamond beauty. It is also overpriced and the diamond coating is not permanent. It can easily be scratched. You are just wasting your money on these pieces of worthless CZ for the price of Moissanite. So if you wan't the best diamond simulant. Nothing beats Moissanite for the price of Asha. double refractive fire just didn't do it for me. Overall, if you cant afford a natural diamond and want that "luxurious" look, simualants are the way to go. I know sona diamond are fake diamonds but is it worth buying. Did anyone see their stimulated diamonds. Is it as pretty as they say? Do they shine like a mined diamond? I have a gorgeous Moissanite 4 carat solitaire which I purchased from Nathalie at LKJewellery. Those who critque the yellow/green hues have obviously never seen Nathalie's stones. Her attention to color, cut and quality are unsurpassed. Unlike generic CZs, which are hype-priced, moissanite stones vary in quality and cut and it really does pay to look around. I would stay away from the big box stores and go to an artisan jeweller like Nathalie. And no, I do not work for her! I am trying to decide between moissanite and a "hybrid diamond" for my engagement ring. I am getting an 8mm stone. Some websites say great things about one and bad about another, but then other sites say opposite. Is an 8mm moissanite gray/green to they eye? Would a hybrid be more visually appealing? I am purchasing the ring from my father-in-law who works with the jeweler company, Stuller, so I can get either at a cheap price. I have an ring with 7, 2mm moissanites and have never notices any color problems, but wonder if it is noticeable in 8mm.